This book is a total gem for dystopian lovers! It has to be one of the more twisted worlds I have ever read- just as mind-blowing as Neal Shusterman’s Unwind Dystology. With that said, it is extremely unique in concept. IT.WAS.SO.BIZZARRE. A train wreck that I couldn’t stop reading. I was completely hooked by the end of chapter one. The story begins in a modern day dog kennel that caters to the wealthy, because these aren't your garden variety pets they breed. What is the pet of choice for the wealthy? Why, a specially bred girl, of course. The idea of humans being specialty pets is crazy, but the way Birch spins it in the world she's created was genius. Every chapter had me saying "No. Freaking. Way". One minute I was feeling so sad and timid for poor Ella (pet number 8), next, I was terrified and then, I just wanted to poison all of humanity and run. As the story progresses and you got a better idea of what Ella was bred to believe verses what she begins to realize is her actuality, it is creepy on so many levels. I mean the process of “naming” the pet as she sat at her little table was unreal. The family literally discussed it over a meal and had a little family spat until the name was agreed upon. All done with Ella sitting there, eating her specialty food. And naming your pet wouldn’t be official until they have their very own tag, right? "I cracked the lid and stared down at the gold chain that glittered ever so softly in the dim light. On the end of it was a round pendant. I lifted it back up and held it to the light so I could see that the gold pendant was encircled with a ring of shining diamonds. Inside something was engraved in loopy script. 'It's your name,' he said, reaching out to run his fingers over the letting. 'And on the other side it has our address and phone number.'" There was a love interest in the story. But, it wasn’t your typical love story of boy meets girl and they lock eyes and blah, blah, blah. It was between people from literally two different worlds. It was hard for me to get the feels with the love story at first because it was just so sad at how innocent poor Ella was, anyone could have taken advantage of her. Then enters Penn, he knows the crushing reality of what Ella is and he despises the entire idea of pets. And really the rest just falls into place, it was really no surprise. What was a shocker was the other man and how freaking creepily he reacts to this budding love. I felt bile in my mouth at times. 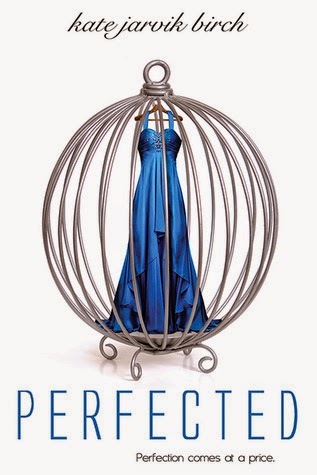 The world of Perfected really made me think that such a reality could happen! There are twisted enough people out there that might actually like this idea and see the potential for profit. Why not add a tax for our choice of pets? I’m telling you the ideas with this are endless. With that said, I still have a load of questions. When did all of this begin? Why only girls? Any information on the actual breeding process? (that sounds so disturbing to want to know, but sadly, I want the details). Why so many questions? Because there is only one word to describe the ending, BRUTAL. The cliffhanger happens right after a high intensity scene and then it just stops. BAM. Done. Peace out. Have a nice life, kind of ending. The saddest part, there is no sign as to when the next installment will be released! Why, Birch, why? Don’t you know what kind of people you are dealing with? We need dates to look forward to and little teasers to string us along. It’s time to get with the program, we want more! Bottom line, this is a must read. Period.